I am a Chinese tea lover. Chinese tea is totally different from western tea, say, the famous British teabag. I like to prepare my tea drinking with teapot, especially YiXing Zisha Teapot. Below is a collection of the ABC of YiXing Teapot. You will not miss it if you would like to know this culture. YiXing (pronounced ee-shing) teapots first appeared during the Sung Dynasty (960-1279) in the YiXing region of China, located in the Jiangsu province, about 120 miles northwest of Shanghai. The Jiangsu province is the world’s only source for the unique clay from which YiXing teapots are made, called purple or red clay. YiXing teapots were relatively unknown for many years until the late Ming Dynasty (1600s) when their use and production began to flourish. Demand from Europe and throughout China fueled an active industry in which many artists developed their craft to high levels of mastery. For the next three hundred years, YiXing teapots attained renown throughout China and Europe. Although the Europeans strove to imitate the YiXing teapots, they could not compete with the unique purple clay only found near YiXing, China. Purple clay’s unique properties make it ideal for brewing tea. The quality most immediately apparent is the attractive color of purple clay. This color, sometimes augmented by natural pigments, is never hidden on YiXing teapots by glazes. Similarly, the inside of YiXing teapots are always left uncoated. The porous nature of purple clay absorbs the flavor, smell, and color of the tea that is brewed in it. Over time, YiXing teapots develop a seasoning from repeated use, making the tea brewed from a well used teapot a special treat. For this reason, most people will dedicate a single flavor of tea to a specific YiXing teapot, so that the seasoning is not disrupted by cross-brewing. People from the US and Europe today are often surprised by the size of YiXing teapots. Most Westerners are more familiar with large teapots that are used to brew tea for numerous people at a time. Although there are certainly plenty of larger teapots for social brewing, YiXing teapots are intended for individual use, producing 1-2 servings of tea. For this reason, the Chinese historically would carry their own personal YiXing teapot and drink directly from its spout, although this is less common today. With continued use, the purple clay from which YiXing teapots are made will absorb the flavors of your tea, becoming more seasoned with each use. Over time, the color, flavor, and aroma of your tea will develop a richness that is unique to each teapot. For this reason, many people dedicate a specific flavor of tea or at least a specific type of tea to each YiXing teapot. Pre-heat your YiXing teapot by filling it with hot water and then draining it. Place one teaspoon of loose tea into the preheated YiXing teapot. Fill with hot water and wait for at least one minute. Enjoy your tea either by pouring it into a cup or by drinking directly from the YiXing teapot, which is the traditional way of using it. Note: Most YiXing teapots are intended to be used by only one person at a time. Their small size is ideal for a single serving of tea. Historically, each person having tea would have his or her own YiXing teapot. To clean your teapot, simply empty the leaves and rinse the teapot with hot water. The natural properties of the YiXing teapot will absorb the flavor of your tea, so washing it with soap would counteract the flavor-retaining properties that contribute to the appeal of YiXing teapots. How do you pronounce “YiXing” in English? Do they really come from China? Yes. The purple clay from which the teapots are made only comes from one place in the world: YiXing, China. 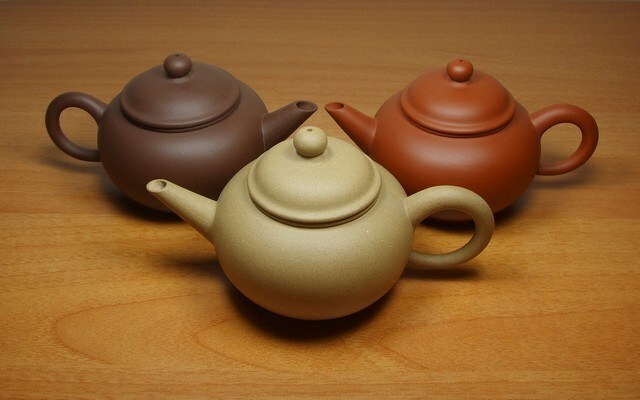 Purple clay has numerous properties that contribute to the fine quality of these teapots. Primarily, purple clay has an attractive color and a flavor-retaining quality. Are YiXing teapots healthy and safe? Yes. All of our teapots are certified to be lead free. And since no glazes are used on the teapots, they are free from the chemicals that one might find in other teapots. How big are YiXing teapots? Most YiXing teapots are only big enough for serving a single person. They are designed this way, for traditionally one drinks directly from his or her own YiXing teapot. Please note: the dimensions of each teapot are listed in our catalog. What is a chop mark? On the bottom of all YiXing teapots, there is a mark that identifies the artist who made the teapot (like a signature). This mark is called a chop mark. This entry was posted in Uncategorized and tagged Chinese Culture, Purple Clay, Tea, Teapot, Yixing, Zisha on November 7, 2014 by INK SAY.